Thin lens equation calculator has been prepared to help you to analyze optical properties of the simple lens. Keep reading to learn about the thin lens equation and understand how a lens can magnify the image of an object. Everything is about light, so make sure to check out the principles of the light refraction too! f is the focal length of the lens expressed in length units. There are two basic types of lenses. We can distinguish converging lenses which have focal length f > 0 and diverging lenses for which focal length f < 0. It should also be noted that when image distance is positive y > 0, then the image appears on the other side of the lens and we call it real image. On the other hand when y < 0 then the image appears on the same side of the lens as the object, and we call it virtual image. Remember that magnification must always be a positive number. That's why we have taken the absolute value of y which generally may be both positive and negative. Let us consider five different situations for a converging lens (f > 0). 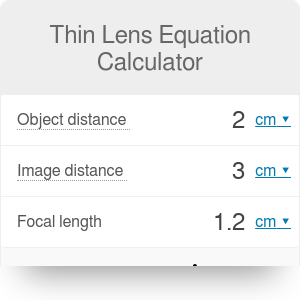 You can check it with our thin lens equation calculator! for x < f image is virtual (y < 0) and magnified (M > 1). We encourage you to check similar cases for the diverging lens which have negative focal length f < 0 with our calculator! Thin Lens Equation Calculator can be embedded on your website to enrich the content you wrote and make it easier for your visitors to understand your message.